Born in Grand Rapids, Michigan, on March 15, 1924, to Frank and Mary Walijewski, Father Joseph Walijewski – or Father Joe, as he was mostly known – learned the hard lessons of poverty through his own experiences growing up during the Great Depression. Like many other families at that time, the Walijewski’s suffered through economic hardship, but held fast to their faith, at once so simple and yet so strong that it served to fill in the want and lack of material goods. Since his early youth, Father Joe sought to serve God as a priest of His Church – and especially desired serving God all his days in missionary work. Some experiences during his youth helped form this calling. As a young boy, he would wander down to the city train station to watch fruit being unloaded, in part with the hope that he might receive a piece of fruit which had either fallen by chance from the crates or was given to him outright through the generosity of the station workers. One day, a worker handed him a banana – his favorite fruit – and when he discovered it had come from South America, this far away land became a source of growing fascination. On the few occasions he could afford to attend the cinema, young Joe was also inspired by the 1938 film “Boys Town,” and its hero and founder, Father Edward J. Flanagan. Joe would watch the movie several times, marveling each time at Father Flanagan, as played by Spencer Tracy, and his gift of working with and engaging children. It was a calling that was cultivated by his mother and, while his father was hesitant at first to let his son go away to seminary at a young age, he too eventually gave the young man his blessing to discern a calling to the priesthood. When speaking of his mother, Father Joe would often recall her three wishes – first, that she would have a son named Joseph who would become a priest; second, that he would build a church in honor of St. Joseph – which he did when he built the chapel of St. Joseph in Villa el Salvador, Peru, during his missionary days; and, third, that she would die on one of St. Joseph’s feast days – a request God fulfilled for her when He took her from this earth in 1971 on the Church’s universal Feast of St. Joseph, March 19. A mother’s prayers and a son’s determination are one thing, but the mysterious will of God, as young Joe found out, was quite another. After successfully finishing his elementary and secondary education in Catholic schools in Grand Rapids, he was accepted at St. Bonaventure Seminary, Sturtevant, Wis., a Franciscan seminary which would help him achieve his dream of becoming a servant of God in the tradition of the beautiful beggar of Assisi. Unfortunately, at graduation, he was told by his superiors that, rather than a priest, he should become a religious brother. He assented easily to the theological propositions of the faith he learned in his classes; but it was the language requirement – at the time, Latin, Greek and French – which proved to be a continual challenge for the young seminarian. Casa Hogar is still connected to the Diocese of La Crosse today. 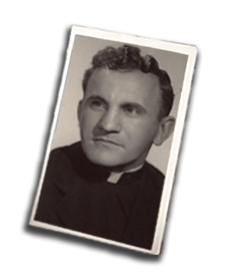 Instead of surrendering his dream to become a priest, Joe successfully applied for admission at the Polish seminary at Orchard Lake, Mich., Ss. Cyril and Methodius. He continued to grapple with his academic responsibilities, but he made a promise to the Lord that should he complete his studies for ordination, he would dedicate five years of his priestly life to the work of a foreign missionary. Granted this prayer – he would finish seminary at Orchard Lake – Joe faced a further challenge. His own Diocese of Grand Rapids would not accept him into its major seminary to study theology because he did not study in the diocese’s minor seminary. He was encouraged to look to other dioceses for sponsorship. Broadcasting letters to various bishops throughout the Midwest, Joe received a reply from only one – Bishop Alexander McGavick of the Diocese of La Crosse, who was looking for Polish-speaking priests to serve the Polish communities in his diocese. Accepted by the Diocese, Joe entered St. Francis Major Seminary, Milwaukee, but his struggle with academics continued. While many among the faculty had little hope for the struggling seminarian, Monsignor John Schulien, a theology professor who befriended Joe at St. Francis, defended the young man. “Joe Walijewski may not be the most intelligent priest,” he said to the other faculty, “but he will be a holy priest.” The priest-professor’s words were apparently convincing: Father Joe was ordained by Bishop John Patrick Treacy as a priest for the Diocese of La Crosse on April 16, 1950. In his time as a priest for the Diocese of La Crosse, he served in two assignments as a parish priest in the diocese and two as a missionary priest in South America. From 1950 to 1956, he served various parishes around the diocese before heading to Bolivia. After serving in Bolivia as a missionary for 10 years, he returned to the Diocese of La Crosse in 1966. 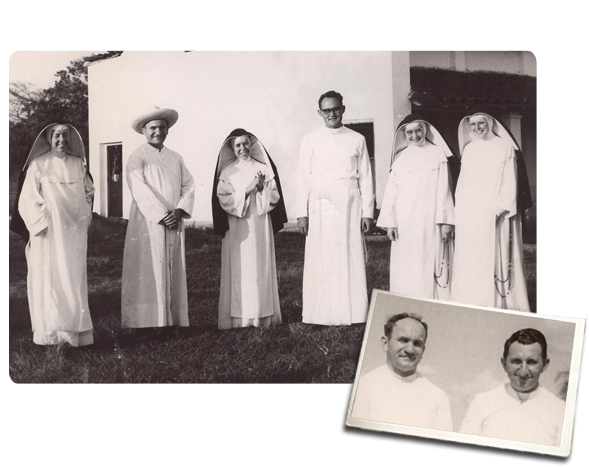 He again served at various parishes until 1971, the year he returned to South America, this time to Peru, where among other achievements he established Casa Hogar Juan Pablo II, the diocesan sponsored orphanage which continues to serve poor children of Peru to this day. There was one more blessing granted to Father Joe before his death in 2006. His desire to die while working for the poor was widely known among friends and coworkers – and he had this wish granted when after celebrating Palm Sunday Mass at Casa Hogar, he took ill and was admitted to a hospital in Lima.